AS part of their access to education campaign, Namibia National Students Organisation (Nanso) has partnered up with Silas Ndapuka Transport Services to provide free transportation to University of Namibia students during the registration period. 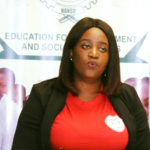 The initiative which started this week Monday will transport students from six pickup points in the Katutura area starting from 06:00 in the mornings to take students to campus. The buses will start picking up students at 17:00 from campus to drop them off at the designated to pickup points. “The buses will pass pick up points starting at Havana Four-Way, Goreangab bus stop, Four Ways on the Otjomuise road between Wanaheda and Greenwell, Hakahana bus stop, Wanaheda bus stop and Okurynangava bus stop,” said NANSO. NANSO added that additional free transport for students to NUST, IUM and other equally important campuses and colleges of which developments, timetable and schedules will be communicated once concrete programs have been arranged.